The Hawaii State Capitol: a Unique Honolulu Landmark. Hawaii State Capitol: A Unique Honolulu Landmark! 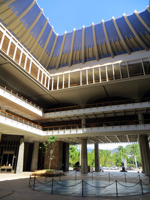 If you appreciate various styles of architecture, the Hawaii State Capitol might be one of the many things to do in Honolulu that will appeal to you. 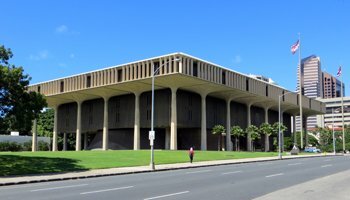 If you’re interested in Hawaii history and Hawaii culture, the Hawaii Capitol building has certainly played a major role in shaping the development of life in our islands. Or, if your plans for Hawaii vacation fun include sightseeing the numerous attractions in the Hawaii capital of Honolulu, our state government seat might be one stop among many in the downtown area. Hawaiian statehood was ratified in 1959, and the Hawaii Capitol building was constructed in 1969. Before that, the territorial government seat – and the preceding Kingdom of Hawaii throne – was located next door to the Capitol at Iolani Palace. The reflecting pool that surrounds the Hawaii State Capitol symbolizes the Pacific Ocean. The two state legislature chambers (House of Representatives and Senate) on the southeast and northwest sides of the building are cone shaped to represent Hawaii’s volcanoes. The 24 columns surrounding the building are shaped to resemble palm trees; and there are eight columns along both the front and back of the building to represent each of the eight main Hawaiian Islands – Big Island of Hawaii, Maui, Lanai, Molokai, Kahoolawe, Oahu, Kauai, and Niihau. What I can’t recall is the symbolism for the open sky atrium where most other capitol buildings have a dome-covered rotunda. It too is reminiscent of a volcano crater; but it also reminds me of ocean waves due to the blue color and curved shape of the ceiling. If you go and find somebody who remembers the open-air symbolism, please post it in the comments below. Finally, the artistic pattern on the floor at the center of the atrium is a representation of the colors you can see in the Hawaiian coastal waters. Although the atmospheric conditions are seldom exactly right for this, I once got a full appreciation of the design concept while it was still wet from a recent rain but vibrant with direct sunlight cutting through the clouds. Under those conditions, it reminds me of Kaneohe Bay. 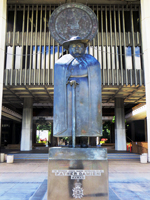 Prominently displayed in front of the Capitol building is a statue of Father/Saint Damien – the heroic Catholic priest who dedicated his life, and ultimately lost it, serving Hawaiians who were afflicted with Hansen’s Disease (also known as leprosy). A duplicate of this statue is also on display at the nation’s Capitol in Washington DC. 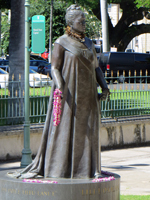 At the back of the building, near Iolani Palace, is a statue of former Hawaiian Queen Liliuokalani. Hanging over the front and back entrances of the Capitol building are giant bronze representations of the Hawaii state seal with the state motto: UA MAU KE EA O KA AINA I KA PONO (ooh-ah mau kay ay-ah oh kah aye-nah ee kah po-no), which translates to: “The life of the land is perpetuated in righteousness”. In the front lawn of the Hawaii State Capitol sits a replica of the original Liberty Bell found in Philadelphia (see photo in the footer of this page). And directly across Beretania Street is an Eternal Flame War Memorial that was built to commemorate the lives lost in the December 7, 1941 sneak attack on Pearl Harbor. If you want to see it, use the crosswalk and be careful. Beretania is a busy street, and the cars move fairly fast in this area. I’ve never had the occasion to do this myself, but I’ve heard that visitors can freely enter the spectator galleries for both the House and Senate. So if you want to see our taxes getting raised in a variety of new ways, pop in for a few minutes. As far as I know, the entrances are on the ground floor. Numerous other free Honolulu activities and points of interest are located within easy walking distance of the Hawaii State Capitol. As mentioned above, Iolani Palace is next door to the back. The Hawaii State Art Museum is across Richards Street to the right. The Cathedral of Our Lady of Peace is two blocks to the right (northwest). The King Kamehameha statue at Aliiolani Hale is across King Street from Iolani Palace, and Kawaiahao Church is diagonal (southeast) across the intersection of King and Punchbowl streets. Probably the easiest way to go sightseeing around the downtown Honolulu area is to take TheBus, which has numerous routes that run right past the Hawaii State Capitol, then walk to all the nearby Honolulu attractions. Check bus routes and schedules﻿ (link opens a new tab/window). But if you prefer to drive, there’s metered parking in an underground garage that can be accessed from Miller Street, off of Punchbowl Street, across from the Queen’s Medical Center. Only park in metered stalls, or your car won’t be there when you return. 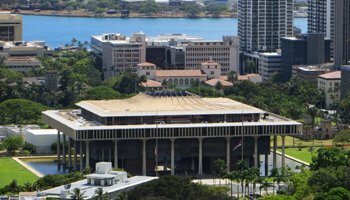 If you need information about a specific activity or event, please go to the official Hawaii State Capitol website (link opens a new tab/window).